Improvement – New and improved Field/Component/Sub Component Statistics Feature. Very fast navigation of messages with matching fields. Ability to select multiple items in the Statistics Grid, and navigate to matching messages. 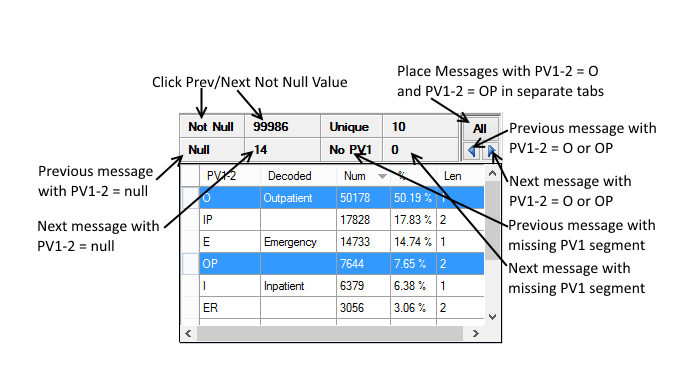 For example, below selecting ‘O’ and ‘OP’ in the Statistics Grid and then clicking the Next/Previous Arrow buttons navigates to messages in the tab that have either a PV1-2 field equal to ‘O’ or ‘P’. Improvement – Added option to increase log verbosity. Bug Fix – Progress bar not showing when downloading files in file explorer if the system has been running for a long time. Environment.TickCount returns a negative value. Bug Fix: HL7DocumentationProviderFactory.GetOrCreateProvider Illegal characters in path exception. Bug Fix – Segment Editor Exception: System.ArgumentOutOfRangeException: capacity was less than the current size. Reported by Biju K.
Improvement – A Cloverleaf New Line message framing option. Requested by Ron B.
Bug Fix – Custom Code – Setting a Field/Component/Subcomponent to null should leave the existing value untouched. Bug Fix – HL7 Editor – NRE and duplicate settings key error. , or Control-M – Turn on/off whether or not the fields specified in “Options/Mask PHI Fields Settings…” are used to hide fields within the HL7 Editor. “Fields to Mask” – Identify specific fields that will be masked in the HL7 message. “Fields to Mask” – Fields identified here will have PHI found in the “Fields to Mask” and “Fields to NOT Mask” sections masked. “Mask Character” – Specify the character that will be used to “mask” the PHI. Improvement – HL7 Listener – Added support for starting the HL7 MLLP Listener from the command line: -mllp port (e.g. -mllp 12000 will start the listener on port 12000. Requested by Nick. Improvement – Licensing – Added the ability to install Enterprise Licenses from the command line. Useful for IT departments that wish to deploy HL7Spy using active directory, or other enterprise software deployment software. Improvement – HL7Spy Application – improved HL7Spy start-up time. HL7 Standard data structures are now loaded in the back-ground as needed instead of loading them all up at start-up time. Improvement- Added support for LZW compressed files. Requested by Jonathan H.
Bug – Fixed issue where no tool tips are provided for pasted in messages. Bug – Fixed NullReferenceException when accessing HL7 Standard information under some situations. Bug – Fixed issue where pasted in messages are not handled correctly. Reported by Adam F.
Bug – Message Editor – Backslashes, ‘\’, are being automatically removed when a message is cut/pasted into HL7Spy. Reported by Adam F.
Bug – HL7 SQL – Show/Hide Path descriptions not working properly. Reported by Barry V.
Bug – HL7 SQL – TS values are not being interpreted into Date/Time values properly. Reported by Barry V.
Improvement – Support for HL7 2.7 messages with the Truncation character ‘#’ included in the encoding characters. Requested by Jose S.
Improvement – Option to control Message detection algorithm. The new option is found under: Option/File Settings/Use Strict Message Detection. When enabled, ‘Strict’ mode provides a more accurate message detection algorithm in some rare cases, however; all messages have to have the same message encoding, and framing. This option is disabled by default. Bug – AppDomain Unhandled Exception caught System.Threading.ThreadAbortException: Thread was being aborted. Bug – Improve copy/paste message in Editor. Reported by Paul C.
Bug – HL7 SQL/SQL Loader: Distinct Button disappearing when multiple query result tabs displayed. Reported by Albert E.
Improvement – Do not adorn the message in the editor with highlighting if it is larger than 5MB to improve render performance of large messages. Bug- Proper version of the HL7 Standard not always honored when selected from the toolstrip. Bug – Fix issue where hitting the escape key when being prompted about deleting a custom function still deletes the function. Bug – Custom Code Tool: Intellisense not working properly for some classes. 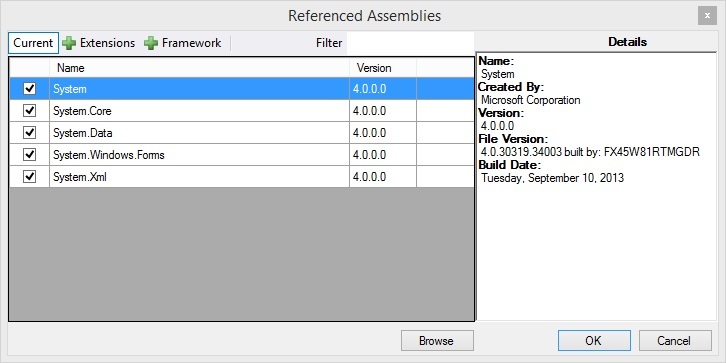 – Imported assemblies are now moved into the proper folder (c:\Program Data\Plugin) automatically. Improvement – Custom Code: Add support for modifying the text, and visibility of the Run/RunOnce/Previous/Next buttons are displayed (OnUserInterfaceSetup). 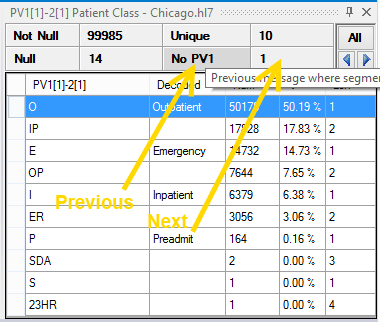 Improvement – HL7 Statistics: Distinquish between NULL and Segment Not Present in HL7 Statistics. Improvement – HL7 Send: Replace X with Recycle bin icon, and add a deletion confirmation dialog to prevent accidental deletion of destination – Requested by Albert E.
Improvement – HL7 Query: Present the “Data Type” that is in the “Description column” to present in a separate column … or have an option to “suppress it” – Requested by Albert E.
Improvement – HL7 Compare: Highlight the first time the sequence in the message changes – Requested by Albert E.
Bug – HL7Parser: Application Unhandled Exception: System.ArgumentOutOfRangeException: Length cannot be less than zero. Bug – Editor: Fix the issue with saving the ShowKeyboardTooltips option – Reported by Albert E.
Improvement – Better positioning of Search Dialog (Cntr-F). It will now track the location of the main application window. Improvement – Add support for 4 character Z-Segment names. Yes, its not valid HL7 but we have customers using them. Why, I don’t know. Improvement – Send HL7 View – Improve the layout, move some configurations to the configuration dialog to free up space, minor bug fixes. Improvement – Add bz2 and gz in the Open File Dialog. Requested by Albert E.
Bug – FTP Explorer – Make sure the MessabeBoxEx owner is a window that is visible otherwise the message being displayed is hidden. Bug – Fix issue with DISTINCT drop-down double spacing found by Albert E.
Bug – Fix Directory being created by the Custom Code Tool every time HL7Spy is started. Bug – Fix Status is being inadvertently modified which results in Sorting… being displayed always.